Top 20 reasons to vacation in Sayulita, Mexico and show your family or group of friends a trip they will always remember. Whether you are searching for safe, beachfront camping or to rent a luxury villa complete with maid, cook, gardener and swimming pool, Sayulita offers some of the best accommodations available in a Mexican beachfront town. All accommodations advertised on this website are by owner and represent the best Sayulita has to offer. The dining experiences and restaurants in Sayulita are almost limitless. If you count taco/torta stands and small “hole-in-the-wall” cafes, Sayulita offers over 100 locations to get a bite to eat. Award-winning fine dining restaurants will tempt you with their lavish menus while taco stands will easily fill you up for only a few pesos. You will never get bored of the limitless supply of fresh seafood, vegetables, fruits, meats, cheeses and now….plenty of good wine from South America, California, Europe and even Baja, Mexico! Sayulita is truly a surfer's paradise, offering lessons and rental boards of all types, boogie boards and even kayaks. The bay has a nice break that is perfect for beginners but offers plenty of fun and challenges for advanced surfers as well. Stand Up Paddleboarding has become very popular over the past few years and Sayulita is a great place to learn. There are additional surf breaks nearby for experienced surfers (day trips, etc.) Some people just enjoy watching the surfers from the beach...We are fortunate to have several world class surfers call Sayulita home. Sayulita is located just 30 miles from the Puerto Vallarta International airport. Plane tickets are inexpensive from almost any part of the USA and Canada. Families and groups of friends can easily rendezvous in Sayulita for a mutually-accessible vacation location. If you do need to make an unplanned return trip ahead of schedule, you can usually be anywhere in North America by the end of the day. 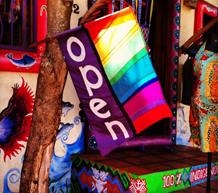 Sayulita has so many opportunities for those who love to shop. 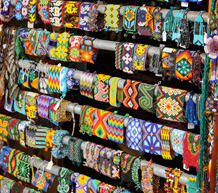 In addition to souvenirs, Sayulita offers a variety of fashion boutiques, art galleries, and jewelers. A variety of Mexican Folk Art, handmade rugs and pottery from Oaxaca, delicate Huichol beadwork, colorful stuffed animals, bags and bracelets from Chiapas...so many things from which to choose. Whether you like handcrafted items made by artisans selling their wares in street markets, or shopping for those one-of-a-kind gallery pieces to ship home, Sayulita has something you may not even know you were looking for. Although growing in popularity, Sayulita is a safe place for you, your family (especially children) and your friends. News reports regarding violence in Mexican border towns should not confuse vacation-goers about the easy-going, peaceful, sense of community in Sayulita, where tourism is vital to the local economy. Unfortunately, as with anywhere in the world, the possibility of crime in Sayulita does exist. At certain times of the year, Sayulita experiences a large although temporary influx of people, along with some rare although significant reports of crime. It is prudent to be a wise traveler and to be aware of your surroundings. Avoid wearing flashy jewelry, displaying large amounts of cash or expensive personal electronics. Use Caution when walking late at night. Travel in groups and stay in well-lit areas. Be aware of your surrounding and of your own behavior. Most crime in Sayulita is petty theft brought on by need and opportunity. An unlocked casa or window, with valuables in view, or the theft of personal belongings left unattended in a public place. As with anywhere you travel, lock your doors and utilize the safe if your rental offers one. With the ups and downs of the worldwide economy, Sayulita offers one of the best “bang for your buck” vacation destinations in the world. 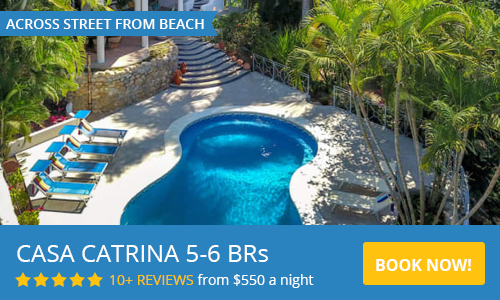 Sayulita vacation rental houses are a great bargain when compared to hotels or houses elsewhere. A family of four can easily fill up on delicious street tacos for less than $10 USD. Swimming, hiking, shopping, surfing, resting, and sightseeing are just a few of the free activities that will keep you occupied during your trip. Sayulita is the perfect family vacation destination. Whether you are traveling with infants, toddlers, small children, teenagers and/or grandparents, Sayulita will provide you with a safe, affordable, action-packed vacation, guaranteed to delight everyone in your group…especially Mom, Dad and the accountant! See our feature in Conde Nast Traveler about being one of the best family vacation destinations. Sand, sun, palm trees and fun. The weather in Sayulita offers a perfect environment for the perfect vacation. We almost NEVER see a drop of rain from November through May. The days are sunny and warm while the nights are cool enough to sleep soundly. Summertime (June-October) offers warmer, humid days with tropical rainstorms at night. The plant and wildlife is spectacular during these months. Sayulita offers some of the most stunning and beautiful places to have that destination wedding you have been dreaming of. Sayulita truly has it all for a stress-free wedding; Beautiful villas, casas and hotels to house your guests are just a start. Add wedding coordinators, florists, photographers, top notch chefs and caterers, breathtaking venues, even spa and salon services for your bridal party and Sayulita quickly tops the list for destination weddings. You may also be surprised to learn that your million-dollar-view wedding is quite affordable, costing generally about half of the average wedding in the United States. In Sayulita, you have found your perfect spot to stay healthy, fit and feeling good on your vacation. Sayulita has a multitude of options to help you indulge yourself, while you detox and de-stress from your busy life. From retreats and workshops, massage, acupuncture and luxurious spa visits, to yoga and fitness classes of all types, your detox vacation will leave you glowing, and feeling great. In Sayulita, you can practice yoga in a studio, on the beach, under a palapa overlooking the ocean or on your own terrace; the possibilities are endless. When you're hungry and want to eat clean, Sayulita's tropical climate provides a wide variety of fresh fruits and vegetables and there are local farmer's markets with organic produce from Nov - May. Smoothies and fresh juices are widely available and delicious and there is a variety of restaurants in the village, where you may find healthy dining options. Due to the smallness and close-knit family structure of the town, the culture of Mexico can be easily experienced in Sayulita. Less than 12 years ago, the tourist industry really did not exist in the village. Over the last decade, residents of Sayulita have managed to retain their heritage and culture by celebrating Mexican holidays with traditional parades, festivals, fiestas, and more. You will experience much more culture in our small Mexican village than almost anywhere else in Mexico. The beaches around Sayulita are perhaps her greatest assets. Whether you are strolling the 2-mile-long beach in front of the village or wandering off to discover some of the less-popular “hidden” beaches, you will be delighted in what you find. Whether you are looking for margaritas to be served at your lounge chair OR to hang out in the shade of a remote palm tree frond, there is always a perfect spot for you and your family/friends. There are excellent and safe areas for swimming as well as areas with waves for surfing and bodyboarding. Fishing boats launch right from the beach as well as do kayaks. The local population of Sayulita is one of its greatest charms. The town was originally founded by five Mexican families who still maintain the largest presence and land/business ownership in town. Visitors and foreign residents are continually commenting on how nice and friendly the local population is. Remember, “hola”, “gracias”, and “por favor” go a long way to helping you communicate. Usually warm and calm, the Pacific Ocean offers spectacular views, activities, and generosity to all of Sayulita’s visitors and residents. You don’t have to walk far from any of the vacation rental homes to access the sea. Fishing, snorkeling, surfing, swimming, wading, and simply putting your toes in the surf are all activities that Sayulita visitors have come to cherish as perfect memories for years after their vacations. The beauty of the surrounding Sayulita jungle is indescribable! With tropical plants galore, anyone visiting the area can enjoy easily accessible settings by hiking, biking, horseback or ATV. You can be in virgin tropical jungles in less than a 10-minute stroll from the main Sayulita plaza. Bird viewing in the Sayulita area is absolutely stellar as is the chance to see one of the many different types of small mammals and reptiles. Sayulita is still small with only about 5,000 full-time residents, although this number increases during the tourist season. It’s impossible to get lost and easy to connect with friends even if they have rented another villa on the other side of the village. No stoplights or freeways... There is only one road in and one road out of Sayulita. The charm of this quaint yet bustling village keeps people coming back year after year. Sayulita is the perfect place for a fun vacation whether it is for a family, a couple, or a group of friends. Look around at the people living here AND those on vacation in Sayulita. Everyone is smiling because they are happy and having a fun time enjoying the multitude of activities this village has to offer.